There is no reason to wake up early, but I wake up at 5:30am. Ugh! I roll over and try to get back to sleep. It doesn't work terribly well. I decide to get up and get going. I can take a nap when I get my cabin at Canyon. So I head out the door and after breakfast, a stop for gas and a quick stop at the grocery store, I turn the corner and head into Yellowstone. Soon I am rolling through the forests, mountains and the river of the Madison Valley. There's not much wildlife this morning and through some madness I tell myself that I will only stop for bears. 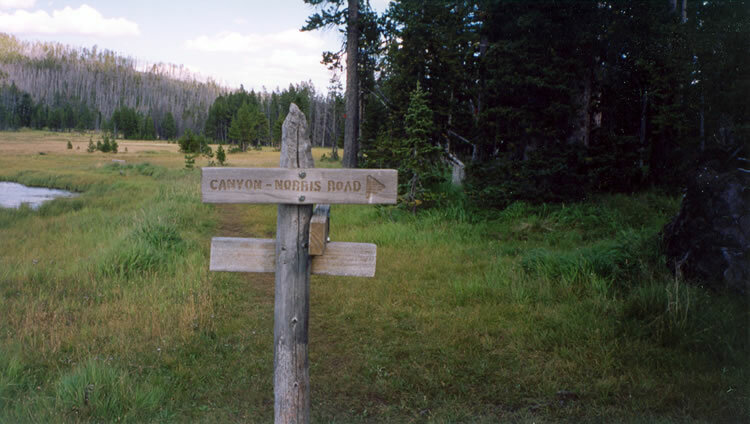 I want to get to Canyon early to get the backcountry permit for 4B1. 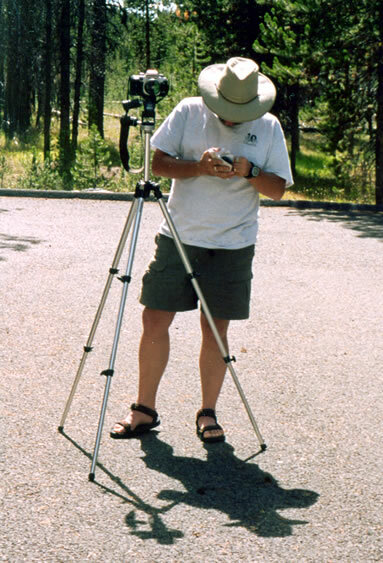 I am supposed to hook up with Mark (from Issaquah) and Rick (in Kent) at 2:30 at the Canyon Visitors Center. Jake and Leslie say they don't have anything else to do and will come with us to Grebe Lake. I pass many bison and elk jams. The Madison elk don't seem to be much interested in anything besides eating and sitting. The rut has yet to come to Madison. 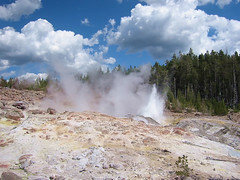 The drive is uneventful, although I feel a strange pull to take a look at Steamboat Geyser as I get to Norris Junction. I arrive at Canyon at about 8:40 or so and head into the backcountry office. I have forgotten all my paperwork. I can envision it sitting on my dresser in an obvious place so I would not forget it, the pink highlighter marking all the important things for me to know. The backcountry ranger is very helpful. We talk about fires and hiking restrictions. Due to the fires, the Pelican Valley area is closed. I tell the ranger we are not going there. I watch the ever-exciting backcountry video and we go through the checklist. After a pleasant half-hour I have my permit and the vehicle tags. 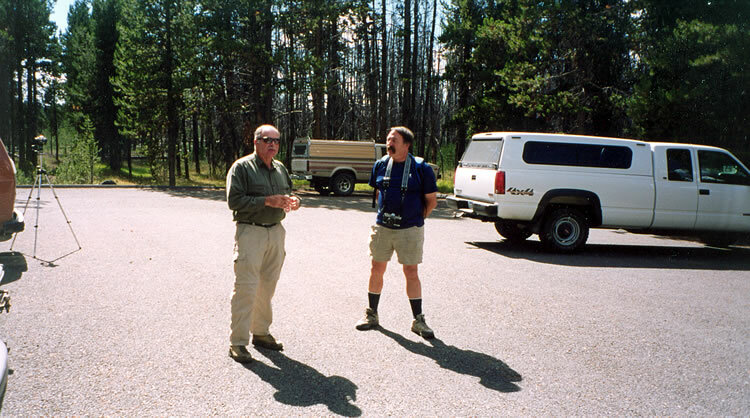 I then head over to the Canyon campground to get a spot for Jake and Leslie. This time I don't want them wandering away for the night in some far away place. I head over to check into my cabin, but they are still being cleaned. So I make what arrangements I can. The nice girl says, "I have a message for you. It's from 'Laurie'." "Oh, that's my wife," I chirp. "It looks like 'LoriD'." she says. "That's not my wife." She says, "I don't want to know about it." But it's Loon LoriD! As usual, I have missed her. Maybe next year at the Loonion. There's not much else to do so I decide to head into Hayden to have a look at the bison carcass that Doug Dance told us about on the Loon board. I find the carcass easily enough. 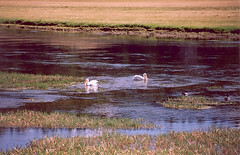 It is right on the bank of the Yellowstone River and right where Doug said it would be. But there are still no scavengers, just a bloated bison carcass, stiff and dead. I take a couple of photos. I tell the guys who are waiting there that I can't believe that I am taking photos of a dead bison. I head down to the Mud Volcano area to have a look around. I have a good time walking the boardwalks and photographing some of the features. I am always fascinated Black Dragon Caldron and Mud Volcano itself. When I get off the boardwalks I head back to Canyon. The morning is wearing on and it would be great to get a little more sleep before I hook up with Rick and Mark.. But my plans are disrupted a bit. I wanted to nap, but I now have no good place to do it. It's too hot in the van. I wander around Canyon Village looking for a nice spot. I finally find a spot in the Lounge. There's really no one around and the lounge bar is not open. I sit down on couch and try to nap. It isn't working. I try to call Tonya. I try to call Laurie. I just kill a little time. Sometime during my restless rest I realize that I could have some lunch and then head on down to Norris to have a look at Steamboat. As I shake off the sleepy feeling I decide that this is a pretty good idea. I head over to the grill and take care of lunch and then drive down to Norris. Considering that a large portion of Norris is closed, the parking lot is pretty busy. I grab my cameras and tripod and head on down towards Steamboat. There seems to be all kinds of people watching Steamboat today. 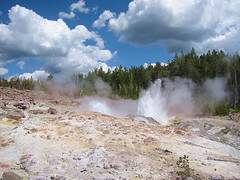 A ranger and a geyser gazer are chatting on one part of the platform. Other people are having their photos taken in front of the geyser. I decide to try the lower platform. Down there I get a good spot for some photos. Steamboat is splashing in various minor eruptions and it is fun to try to capture them digitally and on film. I strike up a conversation with a nice lady and her family. She wants to know what the big deal is about Steamboat. I explain that when Steamboat erupts it is the largest geyser in the world. I also tell her that although eruptions are rare, the exciting news about Steamboat is that it has erupted four times in the last year. Then I reveal the great secret to predicting Steamboat. "Call Mammoth," I say, "and ask when the Park Geologist is going on vacation." When I am given a predictably odd look I add, "All of the recent eruptions have occurred when he has been out of the Park on vacation." So I entertain myself by trying to catch good splashes of water for my photos. I finally give up and decide to head down to Echinus Geyser. I make the short detour over to Cistern Pool. Of course the thing is full. Too bad. (Cistern empties when Steamboat erupts.) As I cross the footbridge over Steamboat's runoff channel, I realize that this is a wonderful viewpoint for Steamboat. I set up my tripod and make some more vain attempts at good photos. I don't think it worked terribly well. After all of this I am beginning to worry about time. I jog down to Echinus and ask if anyone has seen it erupt. The water in the crater is down a bit, but it is not filling quickly. I chat with some of my new friends for a moment. "What's the big deal with Echinus," she says. "Look how close you are to the crater. Just wait until it erupts. It's pretty impressive," I say. But I know I must leave in order to meet Mark and Rick on time. I jog up the stairs and hurry past Steamboat. It's time to get back to Canyon. It is almost exactly 2:30 when I arrive at Canyon. I head into the Ranger Station to take a look around. I browse the books for a moment as I mentioned in an email, but realize that I have no chance of knowing if anyone is Rick or Mark or not. So I go back to the car and dig my Loon button out and while heading back towards the Ranger Station attach it to my hat. Before I get to the door a voice says, "Gary, over here." I look up and sitting on a bench are two strangers. One is Rick and the other is Mark. We introduce ourselves. Mark is here with his roommate. We chat for a little bit and wait. If I understood correctly Jake and Leslie are going to meet us here. So we wait until 2:45. Still no Jake and Leslie. At the moment we decide to leave for the trailhead my cell phone rings. It's Jake. They are already at the trailhead. They've decided not to do the Grebe Lake trail with us, but are waiting for us at the trailhead. I tell them we are on our way. When I arrive at the trailhead I am surprised to find not only Jake and Leslie, but also Ballpark and Tim A. 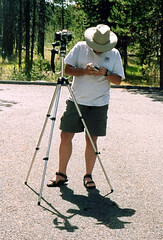 While Rick, Mark and I are grabbing our stuff for the hike, Tim grabs his camera and tripod. Then we line up for the obligatory Loon photo. The only problem is that on the first take, Tim didn't set the camera's timer. Tim announces, "Just a minute" and runs back to his van. He comes back with the manual for the camera. This is too much for Mark and me. We both take pictures of Tim reading the camera manual. Tim launches into a complicated explanation of how the camera has an infrared sensor for a remote shutter release and it is somehow also associated with the 10 second timer. Finally Tim gets it figured out and the appropriate Loon photo is taken. Jake, Leslie and I agree to meet at 6:00 at Canyon for dinner and I tell them their campsite number. It is about 3:15 when Rick, Mark and I hit the trail. The Grebe Lake trail is relatively flat and is easy going. We gossip and chat and generally have a good time. We are passed by only a few hikers coming the other way. Some have been fishing. We see nothing larger than a squirrel along the trail and a few interesting rock formations. After a little over an hour we arrive at Grebe Lake. 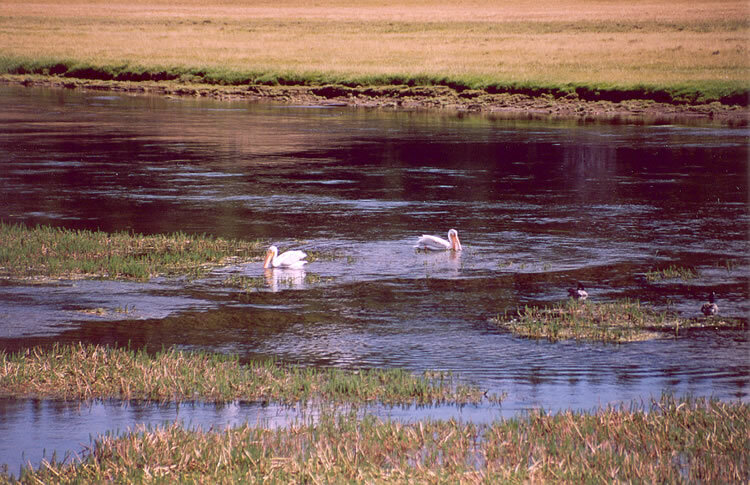 Grebe Lake is much larger than Cascade Lake and is in many ways more picturesque. There is only a light breeze and some rippling on the water, but there isn't a good reflection. No moose either. Too bad. We watch a couple of osprey riding the thermals and there is an eagle shadowing the osprey. On the east end of the lake I can see a few waterfowl bobbing around. I decide to head over to check them out. They are so small and greyish-brown that they are almost non-descript. Although I am able to get fairly close, I am never able to figure out exactly what they are. Rick, I think, spots a building on the mountain on the other side of the lake. We take turns looking through binoculars and camera lenses trying to figure out what it could be. I am sure that it is my summer home. Someone else suggests that it might be a fire lookout. So we take a few photos and shoot the breeze. The day and the conversation is so pleasant that Mark has to remind me that we need to be getting back to the trailhead if I am to make my 6:00pm dinner date. So we pack up our stuff and head on back up the trail. It takes us just an hour and five minutes to get out--that's a little faster than we came in. But when we get out it is 6:00pm. So I am already late for dinner. I hurry back to Canyon and check Jake and Leslie's campsite. They are not there. So I decide to head back to Canyon and get the key for my room. After unloading a bunch of stuff, I head back to Jake and Leslie's campsite. This time I find them and Tim A. there. Jake says he feels like eating at the grill--there is something he likes there--and so we head over there. When we get there we find Mark and his roommate, so we sit with them. Once again Loons take over a restaurant. Tomorrow we are going to Joseph's Coat Hot Springs. So we talk and talk. Jake wants to know what I want to do tomorrow. I want to meet for breakfast at 6:30. Jake suggests 6:45. We agree that we'll try to be at the trailhead by 8:00am. As our gourmet meals wind down, Jake and Tim want to know if I want to come with them to have a look at the fires. I can't. I need to pack for tomorrow. And I am tired. I never got my nap. But I am thrilled to have met up with all these Loons. 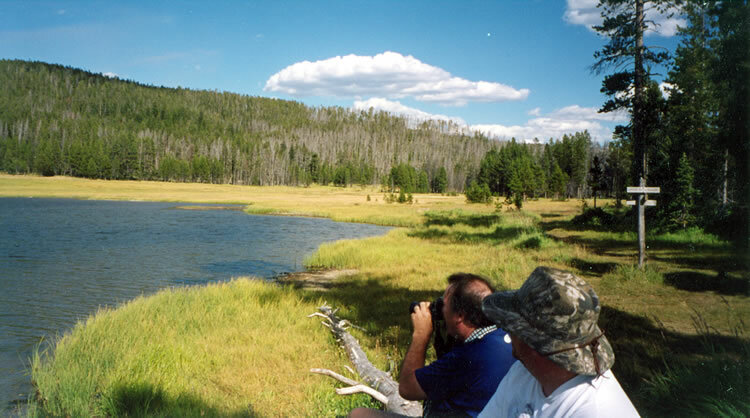 So I head back to my room and Jake, Leslie and Tim head off to find Ballpark and have an evening look at the fires over Yellowstone Lake. The room is very warm and I open all of the doors and windows as I get to work. I use one bed as a staging area and the other bed for laying things out before packing. Fortunately I have brought my backpacking list, so I don't have to do a lot of thinking, just finding. I'm not sure how long it took, but I somehow manage to put it all together, make and repackage the food I will eat and set everything aside as best I can for the morning. In a last effort to be efficient, I take everything I don't need for the morning back out to the van. There is nothing left to do now but to read a bit and get to bed at a decent hour. Tomorrow we leave for Fairyland.